OK, I am new to the forum but have been lurking for some time. I am getting a Kimber Montana in 300wsm. I want a kahles scope. I don't know why I seem to have loyalty to this company, but I do. I have no other scopes from them, but I have a pair of binoculars that I love. (8x42). My conversations with their customer service have been very good, and I am probably going to buy at least 3 more scopes this year. I also want a ballistic reticle as this caliber is capable of utilizing this feature. The Kahles 4D is only in 50mm objectives. I was planning on a 42mm. The differences are small between the two(weight is 1.41 ounces. and the length is only .51"). I would put Talley rings and may have to go with medium. What do you guys think of this setup. I am going to use this for deer hunting and some elk and who knows what else. I know lots of guys put small scopes on the Kimber Montana but the entire setup would still be light. Am I over scoping the Kimber Montana buy going with a 50mm even though the differences between the 42 and 50 are small? How about a Kahles KX 3-9x42 4D, contact SWFA they should be able to get it for you at a great price. According to the Kahles website the 42 does not come in the 4d. I hope it does. That would solve my issues. The Kahles website does not have these new models, but they are available now. Good luck and keep us posted. Contact SWFA and present this thread to them, they should be able to get it for you. Just got off the phone with Kahles. The above chart is not accurate. 4D is not available in the KX 3-9x42. Sorry to hear about the chart, it was presented very early on in the developments of this model. How about the 1.5-6x42 C that is presented on thier website with a 4D option? I think I am going to stick with the KX 3.5-10X50. Unless something changes my mind. That is a very good choice, most of us here prefer 50MM scopes. Good luck and keep us posted. I think I would prefer the 50mm as well, it just seems that the trend on the Kimber Montana is not to overscope the gun. I don't think that you could hardly tell the difference between the two unless put side by side. .5" in length and 1.4 oz. This is just a trend IMO, I would not worry to much about the .5" and 1.4 oz. I like the look of a smaller scope on a rifle like that Montana. It really does justice to the stainless/synthetic look. I have a 42mm Kahles on an M700KS and it is great, I love it. If SVD is around he has some large objective S&B's on some trim rifles and they look pretty good. If you do a search you might find some pics. I sure don't think you need over 10x, though. I agree 10x is on the high side. I think I will like the 50mm objective and the ballistic reticle of that scope. I will do some hunting in low light. I am sure this will offer me excellent low light performance. If that was the main function for this gun I would go for the 4a reticle. I think your choice in Kahles is an excellent choice! I too am a 50 mm fan, but lately have been questioning their usefullness. A 50 mm scope mounted on some guns requires a very high mount which in turn raises your cheek up off the stock. I would try it and see; if its too high for you get a smaller objective scope! Let us know how it works because I'm thinking of moving over to all Kahles scopes! Talley rings suggest that I can use medium rings for objectives up to 50mm with barrels with standard contour. So if I can use that scope, with medium rings I think it will be perfect. If not I will go with a smaller objective scope, but I do think the ballistic reticle is of use in a gun of this caliber, so I would have to rethink alot, because I want the oversized ocular on the Kahles. I think it boils down to making the KX3.5-10X50 work. With this scope, the setup would be hard to beat. I don't anticipate recoil issues as I shot a 45-70 a good bit this year. I truly believe as long as you get high quality glass, which the Kahles certainly is, the difference between 42 and 50mm objectives is not that great until you get into really high magnification and is only noticeable during times when you can't legally shoot (in the U.S. anyway). If you hunt at night, you might be able to realize the low light performance the 50mm obj provides. Otherwise, the larger objective usually requires higher rings and weighs more and IMO hurts the balance and feel of a light, handy, quick pointing rifle like the Kimber Montana. With a 4a reticle the Kahles will still be an excellent low light scope with the smaller objective, plus you'll save some $. I bought most of the 50mm scopes I own not because I really wanted a large objective bell, but because it was the only config the scope came in combination with other features I wanted. Either way, the Kahles will be a great scope. I have the same rifle, with a Kahles 2-8X36 purchased off the sample list. It looks right and performs great. I agree RifleDude, but I think there is a benefit to the 4D, ballistic reticle and it does not come in the 42mm objectives on the new scopes. The difference between the 50mm and 42mm are small as I mentioned earlier. 1/2 inch in length and 1.4 oz. I could get the old 42mm but it is not as good a scope or the 42mm Swarovski, but that would cost about $250 more, and I am not sure it would be that much better. I am pretty sure that I am going with the 50mm, and If I don't like it I will change it, but I have a feeling it would be good. CH, I was basically speaking in general terms. I'm like you; sometimes I'm willing to give up certain features in exchange for others I really want. In this particular scope, there may not be a big difference in weight and length, but still, there is a difference in ring height, depending on which rings you use, and therefore, head positioning on the stock. Admittedly, one of my objections to a large objective scope on a trim, compact rifle are due to my own aesthetic preferences -- I just think a huge scope looks "wrong" on such a rifle. Personally, I'd go for something like a 2-7X36 on the Kimber, but that's me. Good luck with your new rig. Either way you go, you will have top notch equipment! If you go for the CL 2-7X36 accourding to Kahles customer service this is basically a KX scope (no side adjustment) and cost more than the KX 3.5-10x50 with the 4D reticle. If they had the 2-7X36 in the kx line and priced accordingly it would make more sense. It is only 11 " and 13.6 ounces. So the weight is not an issue as the difference between the 36 and 50 is less than 2 ounces, but it would be much smaller. Kahles needs to move that scope over and price it accordingly. They would sell alot more at $600 instead of $800. They told me the CL and KX are the same but without the side adjustment, that scope in 4a should be $200 less. That is the only scope in the CL line without side adjustment. I think they will move soon or change something up they need a scope in that size in the KX line. 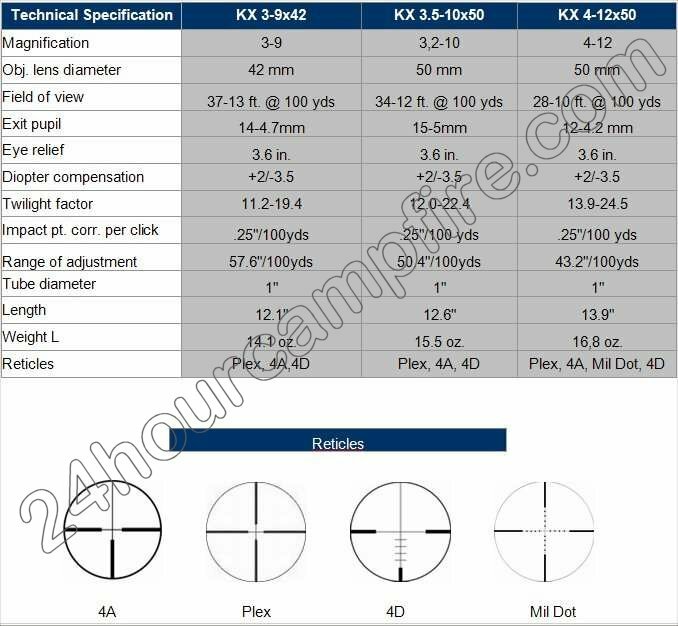 If I go without the 4D reticle I may choose that size scope, but I think it is overpriced compared to the kx line which then puts me at the KX 3-9X42 which isn't that much different from the 50mm with the reticle I want. I feel your pain, CH! I often find myself in these frustrating dilemmas, where I can't seem to get all the features I want together in the same package, whether it be optics, guns, bows, etc. I too don't understand why the 2-7X36 isn't a KX instead of the CL, and why it is priced at $800 when the KX scopes of essentially the same construction are priced less. BTW -- I lived in Natchitoches, LA for 3 years... not Cajun country, but close enough I got to try some really good food. yea, we are recovering from Mardi Gras. The seafood industry will be booming for the next month or so with Lent. I have a few Kimber 8400's. On my Montana 325 WSM I have a Swaro 3-10x42 AV TDS which IMHO is about the perfect scope for this rifle and would be also for one in 300 WSM. The TDS reticle works quite well for 300 WSM's and 180gr bullets, I've used them on a couple. You may be able to still find a 3-9x40 Kahles AH TDS around and that would also fit just about perfect. I've use Swaro 4-12x50's on a couple other 8400's, they look a little large but I like the 4-12's for 270 WSM's. On a Montana I would strongly reccommend Talley lightweight rings. They are just about perfect for the rifle. The 4-12x50 AV's will fit in low talley QR rings or the kimber bases and low leupold rings. I wouldn't use a 50mm scope that I had to use medium rings for on a 8400, they cheek weld just about perfect in lows. How would you compare the Kahles AH against the Swaro? dj, FWIW, there are several folks here who own the new Kahles CL that have owned the Swarovski AV series and in their opinion they thought the CL was better optically and approching the optics of the Swarovski PH series. The Kahles KX scopes are supposed to have the same optics as the CL series.